Doink the Clown is a professional wrestling character originally and most popularly portrayed by Matt Borne, who debuted the Doink persona in the World Wrestling Federation in 1992. He is a clown (or evil clown) wearing traditional clown makeup (or a mask decorated to resemble such) and brightly colored clothes. In addition to Borne, Doink has been portrayed by many other wrestlers both in the WWF (now WWE) and on the independent circuit. Former WWE producer Bruce Prichard said in an interview on The Steve Austin Show that Michael Hegstrand had originally conceived the idea of a miserable clown character. After making appearances in late 1992 in the crowd and at ringside, playing tricks on the fans and wrestlers, the Doink character made his in-ring debut in the WWF in 1993, originally wrestling as a technically sound heel. Doink played cruel jokes on both fans and wrestlers in order to amuse himself and put them off guard. Some of his villainous pranks included tripping Big Boss Man with a tripwire, dumping water on Marty Jannetty and attacking Crush with a loaded prosthetic arm. He clashed with Crush at WrestleMania IX, a match which he won after the appearance of an identical Doink (played by Steve Keirn) from underneath the ring. Doink also wrestled Randy Savage on Monday Night Raw, and substituted for Jerry Lawler, who faked an injury, against Bret Hart at SummerSlam in 1993. Doink then turned on Lawler on the September 4 episode of WWF Wrestling Challenge in Lawler's The King's Court segment, making Burger King jokes to amuse the crowd and eventually emptied a bucket of water over Lawler. Matt Osborne, the original man behind Doink, was fired for re-occurring drug abuses, eventually leaving the gimmick (after bouncing through a few others) to Ray Licameli (also known as Ray Apollo). Now as a fan favorite and with a new midget sidekick Dink, Doink was more of a comic relief character, but continued to pull pranks on other wrestlers (albeit more harmless and silly than outright cruel), mostly on heels like Lawler and Bobby Heenan. 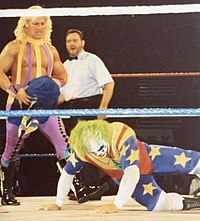 Doink and Dink also battled with Bam Bam Bigelow and Luna Vachon in a feud that culminated at WrestleMania X. Doink would later encounter Jerry Lawler again in a match at Survivor Series. In this match, Doink and Dink teamed with Wink and Pink to meet Lawler's dwarf team of 'little kings' Queazy, Cheezy, and Sleazy. Eventually, Doink became a jobber, regularly losing to wrestlers like Jeff Jarrett, Hakushi, Waylon Mercy and, in his final televised match in September 1995, to Hunter Hearst Helmsley. Doink reemerged one last time in 1997 at the Slammy Awards and was attacked by Stone Cold Steve Austin, amidst crowd chants of "kill the clown". Doink (Matt Osborne) also had a few matches in 1994 in southeast Michigan. He faced off against Bastion Booger on July 14, 1994, in Port Huron, Michigan. He also wrestled alongside some other now known names such as Al Snow and Terry Funk when wrestling for MTW. Following his departure from the WWF, Osborne appeared (as Matt Borne) in Extreme Championship Wrestling (ECW) for several matches as Doink in a blue and green clown suit, setting up an angle where ECW champion Shane Douglas criticized Vince McMahon for turning a talented wrestler like Borne into a comic relief character, and claimed that he knew how to bring out Borne's full potential. Borne then made a few appearances with Douglas as "himself", sporting his face half-painted with the Doink makeup. His attitude insinuated that he had developed borderline personality disorder from having been forced to wrestle as a clown; after winning matches he would dress his opponent in clown accessories to humiliate them. His ring name under this gimmick was "Borne Again". Since 1997, Doink has appeared sporadically in WWE. Ray Apollo returned to play him in the Gimmick Battle Royal at WrestleMania X-Seven. On December 10, 2007, Doink played by Matt Borne participated in a battle royal of 15 WWE alumni for the Raw 15th anniversary special episode. Played by Nick Dinsmore, he showed up in the A.P.A. Bar Room Brawl at Vengeance in 2003. He was selected by Rhino to face Chris Benoit on the July 31, 2003 Smackdown!. Played by Steve Lombardi, he wrestled Rob Conway on an October 2005 episode of Raw. On June 2, 2007, Doink, Eugene and Kane defeated Umaga, Viscera and Kevin Thorn on the 34th edition of Saturday Night's Main Event. On the July 12, 2010 Raw, Doink teamed with William Regal, Primo and Zack Ryder to lose to Santino Marella, Goldust, Vladimir Kozlov and The Great Khali, when he was pinned by Khali. On the July 2, 2012 Raw, he made a surprise return and lost to Heath Slater. He reappeared on July 23, alongside several other WWE alumni, to help Lita take down Slater on WWE Raw 1000, the one thousandth episode of Raw. In early 2010, Osborne reinvented the Doink character to resemble Heath Ledger's portrayal of the Joker in The Dark Knight, nicknaming the incarnation 'Reborne Again'. The new character debuted on March 27 for ISPW in New Jersey. On May 23, 2010, Doink the Clown, portrayed by Dusty Wolfe, interfered against Skandor Akbar and his men Dr. Knuckles and Rommel. This caused them to lose the Wrecking Ball Wrestling tag titles. In retaliation Akbar called on the original Doink Matt Borne. Wolfe and Borne were scheduled to meet on August 15, Wolfe would later no show the event. On August 8, 2010, Borne, as Doink the Clown, won the Wrecking Ball Wrestling Championship. Matt Osborne – the original Doink, left WWF in December 1993, died June 28, 2013. Steve Keirn – wrestled as the "illusion" Doink at WrestleMania IX and occasionally the "real" Doink at house shows. Steve Lombardi – occasionally wrestled as Doink at house shows and dressed as Doink for various WWE appearances. Ray Licameli (Ray Apollo) – wrestled as Doink in the WWF after Osborne left the company. Dusty Wolfe – wrestled as Doink in the NWA and other indie promotions. Ace Darling – wrestled Scotty Flamingo as Doink on a Smoky Mountain Wrestling card in November 1994. Eugene – wrestled as Doink on the July 31, 2003 episode of SmackDown!, losing to Chris Benoit. Jeff Jarrett once dressed up as Doink to pull pranks on Dink. Men on a Mission and The Bushwhackers wrestled as "The Four Doinks" at the 1993 Survivor Series. Chris Jericho took on the persona of Doink in order to perform an ambush on William Regal. Doink is a playable character in Acclaim's 1994 video game, WWF Raw, Midway's WWF WrestleMania: The Arcade Game (1995), and SmackDown vs. Raw 2009 (2008) (as a DLC character). ^ a b c d e "Doink the Clown". WWE.com. WWE. Retrieved March 4, 2018. ^ Rubin, Roger (1996-07-07). "School of Hard Knocks: A Daily News Reporter Gets a Serious Education Learning the Professional Wrestling Ropes". New York Daily News. Retrieved 2018-04-10. ^ "Professional wrestler Licameli enjoys life as Doink the Clown". New Jersey Hills Media Group. 2001-11-15. Retrieved 2018-04-06. ^ a b c d e f "Doink profile". Online World of Wrestling. Retrieved 2009-09-05. ^ Brad Dykens. "Brooklyn Brawler's OWW Profile". OWW. Retrieved 2008-12-03. ^ "Pruett's Pause: WWE Raw SuperShow - A.J. Lee gets the central focus, C.M. Punk and John Cena tease tension in their match against Chris Jericho and Daniel Bryan, Jericho plays his greatest hits, Paul Heyman responds to Triple H again". ProWrestling.net. Retrieved 2012-07-16. ^ a b Oliver, Greg (April 12, 2010). "Doink the Clown 'Reborne Again'". SLAM! Wrestling. Retrieved 2010-04-13. ^ Martin, William (May 26, 2010). "Wrecking Ball Wrestling results from 5/23 featuring Skandar Akbar". Indy Wrestling News. Retrieved 2010-04-13. ^ "The 4 SMW matches fought by Ace Darling in 1994". Wrestledata.com. Retrieved 2 February 2015. ^ "NWA Southwest Television Championship title history". Puroresu Dojo. Archived from the original on 2010-09-20. Retrieved 2010-09-18. ^ "Pro Wrestling Illustrated Top 500 - 1993". Wrestling Information Archive. Archived from the original on 2011-09-19. Retrieved 2008-07-14. Wikimedia Commons has media related to Doink the Clown. This page was last edited on 6 March 2019, at 10:39 (UTC).